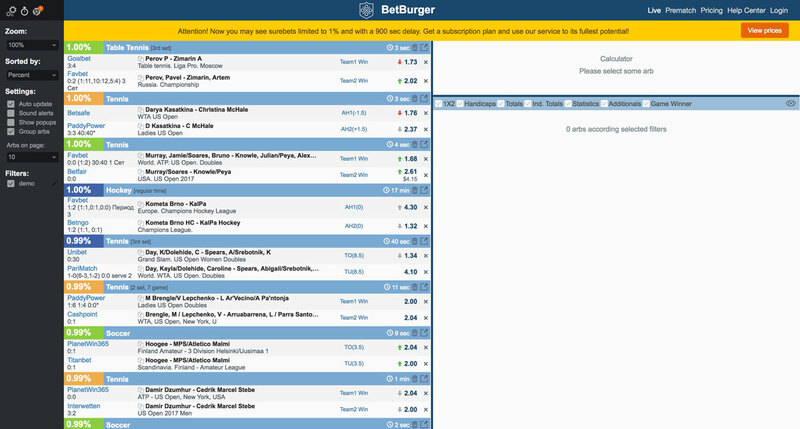 Betburger: Surebet Scanner overview and feedbacks of it. 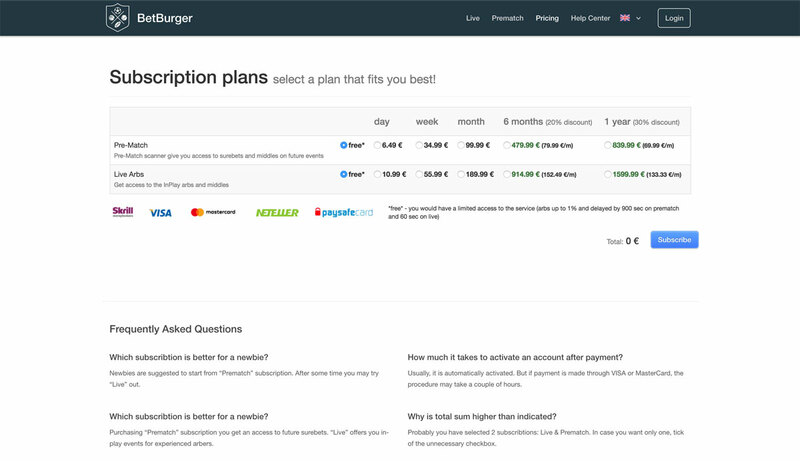 For service, several tariff plans are provided, and each user can select the most appropriate in order not to pay extra for functions he doesn't need. You can purchase subscription of any duration, from 1 to 360 days. 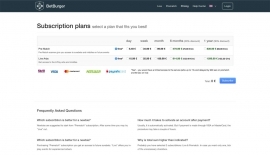 When buying 6-month subscription, 20% discount is provided for tariff, and 1-year subscription provides 30% discount. Subscription to any tariff can be "frozen", i.e. suspended in case if you don't plan to use service for short period of time (up to 7 days per time). 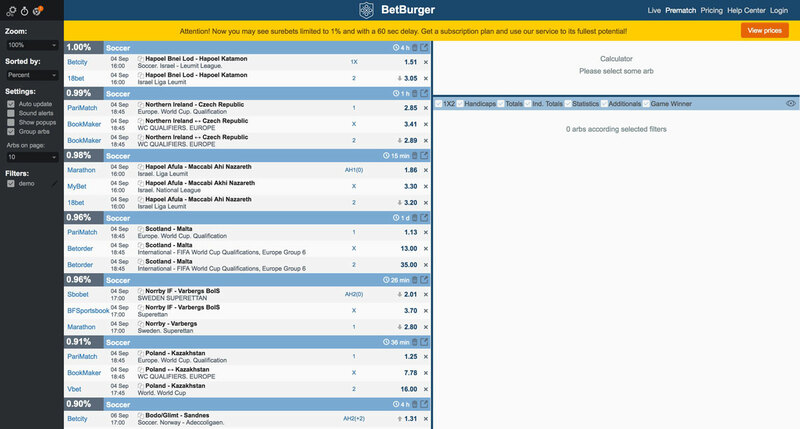 Betburger is surely today's best surebet and arbitrage situation scanner. And though our rivals are always up-and-doing, Betburger still develops faster than anyone. Number of scanned bookmakers – over 100 (64 bookmakers and 88 clones for prematch and 55 bookmakers and 81 clones for live surebets, respectively). Speed of scanning – 3 seconds for live surebets and 15 seconds for prematch surebets. It's fast by today's standards. 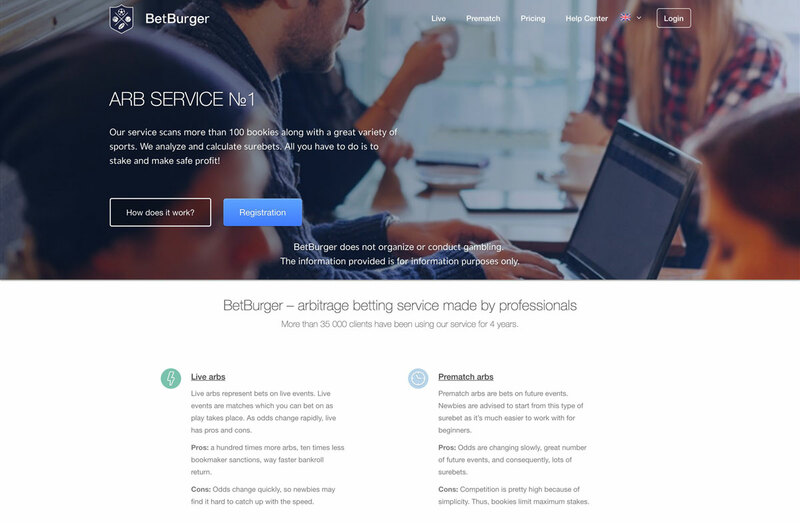 Besides work with surebets, which the main task of the scanner, Betburger also provides an odd comparison service. It is mandatory for analysis of odds change also known as leads movement. For high-quality and comfortable work, scanner provides flexible filter system. It allows to increase speed of work with surebets. This applies especially to the live surebets mode. Also, the interface is user-friendly and doesn't scare a user away with unnecessary elements. It's well optimized for various devices. Additional tools must be especially noted: Surebet Calculator is one of the most convenient among many other similar calculators. It calculates both two-odd bets and multi-odd bets. It is intended for users planning to make profit professionally without risk of restriction which is a significant support. Same regards to the warning system provided by the service. Alarms are set by many criteria and significantly facilitate player's activity. How does it work? A detailed description of surebets and their generation. Arbing Academy. It contains a lot useful information both for beginners and professional players. FAQ. Answers to frequently asked questions. Manual. Detailed description of all functions and features of the AllBestBets scanner. Blog. Consulting articles about surebets and sport bets in general. Forum. Provides communication with mate surebeters. Having paid selected tariff, player receives data to enter his personal profile. In the left part of the screen, panel of scan results display settings is located. Surebets can be sorted by profit rate, ROI (if available in tariff), age, event start time. User can also switch to the middles scanning results. In order not miss new surebets, sound or text notification can be used. Besides standard surebet arm calculation, built-in surebets calculator also provides very convenient feature "close odds". It will be required in case if odds of one of the surebet arms decreased, and you need urgently replaced at another bookmaker. For users' convenience service provides hiding menu allowing to remove from results list a certain surebet, event or bookmaker in general. Arb Helper. This is in-house development allowing to make bets directly from the calculator in bookmaker's shop. This feature is implemented as plug-in (software) that can be downloaded for free at scanner web-site. No-delay access to the Betfair bookmaker surebets. Bets can be made quickly directly from our scanner interface. Easy integration, 3 steps only, described at surebet scanner web-site. Odds comparison service. This feature is also available after registration. Bookmakers' odds are scanned, and best offers are listed as table. All you have to do is choose an event and market, and ABB finds best odd. The scanner is implemented in an online version with a browser access, so it is convenient to use it with any device, including Android and iOS devices. Mobile version of the website is also available. Thus, wherever you are – home or, for instance, cafe, you can use surebet scanner both on desktop PC or smartphone or tablet – convenience and operability will be the same. Possibility of extra-short-term subscription, whether for one day or a year. When extending the subscription, price per day decreases. Unique additional features such as Close Odds, Arb Helper and Integration with the BetFair Exchange Market. High subscription price, especially for Live tariffs. Sometimes some bookmakers disappear from scanning results. It's most likely due to bookmakers bans rather than scanner software failures. Most users appraised work with scanner as 9 of 10. The appraisal was based on speed and stability of scanning, convenience of work at basic functions, errors in displayed results. Price policy of the scanner was appraised as 6 of 10. A position of administration of the project is that there can't be any substance of the matter which is impossible to solve. So share your opinion, enter into the debate. We are grateful for all feedbacks! The website is clear and convenient for me. For 2 years of betting there, we got used to each other. In the very beginning, it was very difficult to handle highly-dynamic surebets. But over the course of time, I got the hang of it and started working with lives only. Usually I use PC, but should I need to leave for a couple of days, it is quite good to bet using a smartphone. Sure, every gambler has their own preferences, but I recommend BetBurger as a great tool — consider it. Came to BetBurger official website. It was all beautiful, even in the Subscription Plans section. However, when I saw the prices I realized it was too costly for me. No way to name myself a professional arb better, so such plans would not be profitable for me. BetBurger’s main features are simple and functional. 1% bets are free, but there is a limited resource access with 900 seconds delay for Live betting and one minute for PreMatch. Young people who speak English and make first steps in betting can fill this niche to get acquainted with the scanner. For serious gaming, the monthly payment of 189.99 Euro (Live) and 99.99 Euro (PreMatch) gives bonus features with profitable bets. I think for beginners it's better to start with "PreMatch". BetBurger is one of the few resources to scan unpopular events, it is clearly an advantage. I'd like to note the multi-operation calculator with an option to prompt all odds for a specific outcome. In addition, it supports popular payment systems like Qiwi, Skrill, WebMoney, which is also most welcome. They are simply added to the relevant section, the Settings tab. The choice of the desired currency and the bet calculation are made automatically. It's convenient.